What system to use for my OSR expeirence? Well I have thought in the past that I could just write up the perfect RPG. I can't. Real Life issues take up too much time. I do have time to write a bit here and there BUT what system will do what I need it to do? I was driving back home on a surprise weekend off and it hit me. Castles and Crusades. It's got all the goodies of the old school mixed with the new school BUT most of all it's easy to run and play. It's easy to write for as well. Well it will take very little time to "convert" my adventures to C&C. My group still has the 4th edition blinders on but this weekend there will be another victim running 4th edition and I will be the player! Aha! I shall reek havoc on his poor brain! I also shall let him borrow my old C&C rulebooks as well. Then he shall see! WOW! I just talked to Ernie Gygax! I was on facebook and he was online. He was just a cool guy. I thought that any Gygax would be a multi-millionaire and not have to work. Come to find out he is not super rich. Huh? Who would have figured? He invited me to Gary Con. As of this time there will be no action taken on C&C Castle Zaygig. Gary's assistant that worked on CZ will be at Gary Con so beg him to finish CZ! I invited him to join the OSR movement. The History of RPGs in Lake Charles, La? Boring? The History of RPGs in Lake Charles, La or should I say the history of gaming in South West Louisiana? I am attempting to find out the history of Role Playing Games in the Lake Charles area and surrounding SWLA in the late 70s and early 80s specifically, but also up to the current age we live in now. This may be a hard task but will be a cool endeavor IF I succeed in getting a loose history of such a arcane subject. This will not be an easy task. Of course history is always told by the victors and will change in time. Hell I may even awaken some old school gamers from their slumber and reignite the old gaming flame. DIE! NPC DIE! Musings on newer editions and OSR. Some (not all) of my players who are 4th edition players complain that the old school games are just too deadly (but back to that later). I just bet if they were running the clunky 4th edition rules they would not be so loving of the game. After a long absence from gaming, we as a group are trying to get back into our weekly game. The problem is I have forgotten the many rules that drive the 4th edition. Like the 3rd edition the 4th edition has it's problems. While the 3rd edition was a complete monster to write for it was fairly easy to run. It just took HUGE amounts of time setting up the stats. The 4th edition is not at all hard to set up with the DDI tools they provide. But running it is becoming a monster. If everyone does not know their character the game stops. All information is printed on cards from the character creator for ease but still some of the players just don't learn their class. At the same time they don't want try try something with less rules. For me my cleverness as a Dungeon Master is zapped due to having to keep up with the per round conditional stats and modifiers. Too many damn hit points! Every monster is a full character! I like less rules and more story. I keep getting that look from some (but not all) my players when I suggest "let's play something else like S&W?"! The 4th Edition D&D is not a religion or cult but there always seems to be the fanatics. I swear to god it's a look of disgust at any idea that we actually try something else. I am an edition whore who will play any version and like it BTW. Well friends 4th edition is burning me out. The old versions too deadly eh? Well I just am going to have to amp up my 4th edition games if I decide to run anymore for awhile as I will be working many hours the next few weeks. It will be deadly at the Old School level. When I pick up a copy of Swords and Wizardry plus my short and few house rules it just allows me to create. I don't need a computer program to assist me. 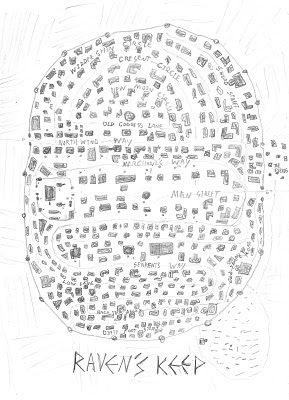 I write these wonderful dungeons and make these cities like Raven's Keep and the entire land in just a few hours. BUT back to the point of this musing. The game play flows FAST! Blood flows! Very few rules to keep up with. AC, HP, Mov, and damage. I can run a huge group of monsters and NPCs with not the least bit of pause to look up rules. But players die. They die very easily and quickly. Many of the times they die with long range weapons in hand that would have dropped the monsters before they even got to the players. Strategy is what it is called. The main strategy that I use is called DIE! NPC DIE! This saves the player's lives when they don't use strategy, for a short time at least. When there is a chance for an enemy to shoot at the party they always aim at the NPCs first. NPCs in my games die like sheep to a slaughter. Now there is a small chance a stray arrow or attack will hit the players but the random dice roll always leans to the NPC. Many players have gotten mad when their characters had a crush on the NPC but ultimately it the player's fault if the NPCs die in droves. I also try and help the players with the NPCs as well. Many of the NPCs will use the Ranged Weapons on the monsters while they are closing on us strategy. The NPCs will also scold and advise the players that are not using strategy. There is one NPC I really like a wise Elf bowman who has amazingly wiped out many a goblin with his bow. If I can ever get the players to play some old school I might just get to run him again. If your Old School game is too deadly try serving the party to the monsters in courses. First as an appetizer a delicious NPC then for the main course the Players, UNLESS they decide to make it real hard for them. Well will have to start a job for the next 10 days or so so no gaming for me for awhile. Just to help inspire others here are my incomplete notes for The Little Barony: Raven's Keep. Left very bare so that story can be added. 2.Baroness' Temple C7 Shel-Elene Worshiper of the Goddess of Grain Keres. 4.Stewart's Home: Many saves and servants. 30.University: There are various mage orders at odds with each other. They will take it to the streets after dark. There are other non university mage orders but the University Mages believe themselves the authority over all mages. They are trying to get the authority to have a Mage License. Eastern Front is where most of the slaves in the west come from. Zeuzalonian from the Land of Zeuzaylon. Looks are above average. Most braid hair upon adulthood and they wear Romatoga a light cloth wrapped clothing. The Zeuzalonians are the lowest of all people followed by the Hattir, Dwarves, Halflings and any other foreigners. To the NE there is the Gras-zi. They have jet black hair and pale skin. They are know as a race of “Thieves”. This native race has very few people left as the Mastdellian Empire conquered them long ago. Very prized and sought out as slaves. The Hattir are the natives of the western borderlands that were conquered by the Mastdellian Empire. The Mastdellian Empire are the people of the eastern kingdom some 14 days away to the east. Elves are mistrusted. There are the Adarian (Adara) and the Felsparaians (Felspara). The Felsarians come to trade wines, skins and weaponry. The Baron ravaged an Adarian Elf Princess and now there is a state of war and any elf found to be Adarian is to be imprisoned and interrogated. Any insults by a lower. Duels are good if both agree. Well I was one of the dum...I mean people who bought the $100 WHFR3rd. Have not played it yet. SO far it appears that I bought $30 worth of game for $100. When I actually get around to testing it out it actually might be worth the price. It might just be the best damn thing ever. I am going to keep telling myself that. I think that a $100 price is going to kill this edition of the game and for the most part it will rot on the shelves. Once I get over what I think I will try it out.